If you have only heard of Eve, Sarah, or Mary as significant women in the Bible, then you will enjoy reading Bible Women: All Their Words and Why They Matter. This book can be used in two ways. The first is as a reference tool. If you want to know what the servant girls at the High Priest’s House said, you can easily find the references on page 377. 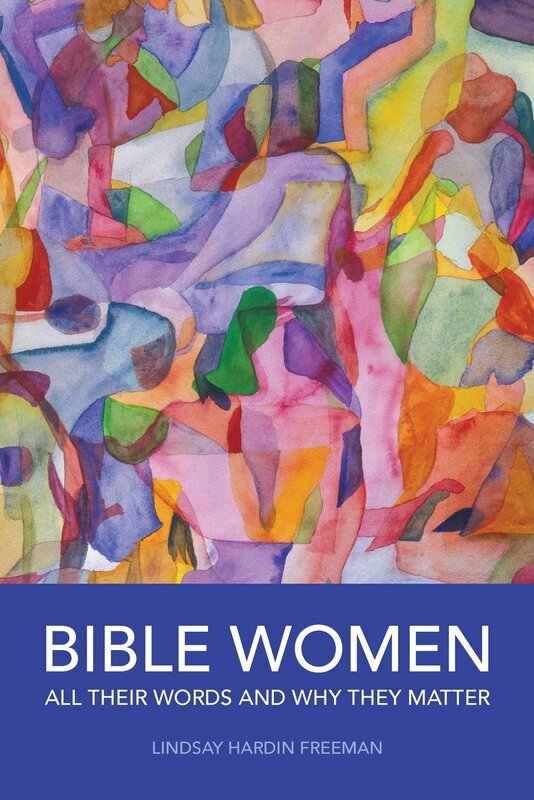 Readers can also use this book as a way of entering the stories of each woman in the Bible. Many of them are not named and do not have as many descriptions attributed to them as their male counterparts. In Bible Women, the role of each of these female characters is deemed significant and explored in the text. Hardin Freeman helps readers understand each woman’s role in the context of the biblical narrative. She describes the scene, the historical significance, and the emotional component, as well as the importance of each woman to the broader narrative. There are also reflection questions at the end of each chapter. These questions are helpful for group study as well as personal devotion. The reflection questions broaden the reader’s understanding of each biblical woman’s identity and role in Scripture. In addition to the book being divided by Old Testament and New Testament, each woman is also ranked on a scale. The scale ranges between high and low profile characters. If you want to read about Mary, the mother of Jesus, she is considered a high profile woman. Most people, Christian or non-Christian, have heard of Mary. The woman caught in adultery in John 8 is considered moderate on the scale. She only said three words to Jesus. Most people who have read the Gospels more than once will recognize the encounter Jesus has with this woman. Within the pages of each chapter, there is a section titled, “Consider This.” In these sections, Hardin Freeman simplifies the events in each passage of Scripture, by providing her own helpful summarization of the event and an explanation for why the event occurred. What is unique to this book is that Hardin Freeman includes all of the women in the Apocrypha. I cannot think of any other resource other than the Apocrypha itself that describes the story and character of each woman. In this book, the reader will find that there were many different women in the Bible, some who were influenced by others like Eve in the Garden of Eden, others like Jezebel, who was one of the most destructive women named in the Bible, and still others, like Miriam, who honored God with their life and personal mission. Women have not been given equal credit in the church throughout history. We do not often hear about the contributions of biblical women, but they are there. We often overlook them because they are unnamed or not given the same edification as their male counterparts. Christians often hear about Moses and Aaron but they rarely learn about the significant contributions of Miriam. It was Miriam who helped Moses survive and grow up as a prince in Egypt. Miriam helps both of her brothers when they take the Israelites out of Egypt. Many contemporary readers overlook Miriam’s role and leadership position. She praises God in song and dance and leads others in their newfound freedom. Miriam encourages the Israelites to stay the course with God—to praise God and worship him alone. Hardin Freeman’s book expounds upon each woman’s contribution to the biblical narrative. Hardin Freeman also encourages her readers to dig deeper within the holy Scriptures. We, the readers, are asked to look at the stories of these women and see how they apply to our lives. On page 90, Hardin Freeman asks her readers, “What might we learn from Miriam?” She lists four things and then asks reflection questions. When I read the first four things, I thought of ten more that I would like to remember about Miriam. The beauty of this book is that it is interactive. Hardin Freeman starts a conversation that is open-ended. The reflection questions are a great stepping stone, but they are not meant to close or end a conversation. The reflections questions are meant to engage the reader, opening up an internal dialogue. Jesus has an encounter with a Canaanite woman in Matthew 15:21-28 and Mark 7:24-30. On page 371, Hardin Freeman asks this reflection question: “Describe your sense of the Syrophoenician or Canaanite woman. What kind of picture emerges?” Your answer could be different each time you read this passage and reflect upon it. You may relate to the fact that she is a Gentile asking Jesus to free her daughter from the demons. You may think about how bold she is to speak to a man she knows will see her as very different from the Jews. Hardin Freeman periodically gives a Bible woman a contemporary nickname. For example, King Belshazzar’s mother is referred to as the Sherlock Holmes of the Bible. She is the last woman in the Old Testament to have her words recorded. Belshazzar’s mother remembered Daniel. She attempts to bring truth to a dark reality, but is ultimately unable to save her son. Do you remember the servant girl in Second Kings? I did not remember her contribution and glorification of God until I reread portions of it in the text. This servant girl gives her captor’s wife information that leads to his healing. The servant girl is never named. Her parents are not named. We do not know much about who she was or how she was raised. We do know that she was not angry about her situation. She could have concealed the information that would lead to her captor’s healing, but does not. Did you know that the gospel accounts vary regarding the women at the empty tomb, yet each account has common denominators? Hardin Freeman gives a side by side comparison on page 392. For the most part, women are overlooked in these passages. Our Easter services are focused on the empty tomb and the resurrection of Jesus. We have not given credit to the women that brought the news to Peter and John. We have not thought about Mary Magdalene’s encounter with Jesus after his resurrection and her eagerness to tell Peter and John all about it. After you read this book, you will want to go back through the Bible, passage by passage, exploring the text in light of all of this new information. You will think about the context in a new way. You will think about a problem or a situation this passage helped you deal with differently in the present. You will think about how many women worked to bring God’s voice into a situation or circumstance in the biblical story. Hardin Freeman’s Bible Women will prompt you to think about your own contributions to the kingdom of God. How have you been fruitful? If there is an area in your life where you have not been? What can you do differently? What hope can you bring to a desperate situation? If you are looking for a quick and easy reference tool that includes each and every woman of the Bible, I encourage you to utilize this book. If you want to go deeper into each woman of the Bible’s story and legacy, I encourage you to read this book in a discussion group. You will want to explore the Scriptures and contemporary references with others. If you are looking for personal reflection, I implore you to go through the reflection questions slowly, engaging fully with the unique interactive element of this book. Ultimately, Hardin Freeman helps readers think critically through the cultural and contextual applications of each woman in the Bible, interacting with readers on an individual level through the text. Bible Women: All Their Words and Why They Matter brings each Bible woman’s experience out of the shadows into the light and into our own contemporary life experiences. Hardin Freeman’s resource declares the life stories of female Bible characters relevant and worthy of the same honor as the stories of their male counterparts.